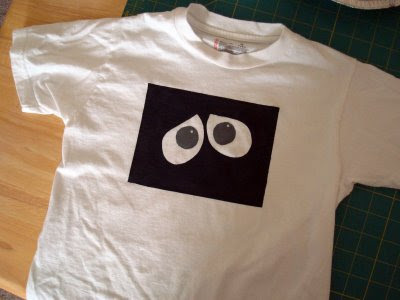 I saw this tutorial for freezer paper stenciling and I thought the shirts were so cute I wanted to try it. I already had all of the stuff for it, and I just grabbed one of my son's pajama shirts to do a test - that way if I messed up, no one would see it but us! My boy is a huge Wall-e fan, but we're not big on buying t-shirts with logos and decals all over them. This to me, is a nice compromise. He felt it was "Wall-e enough" and it wasn't as in-your-face as some of the store bought shirts can be. The process is very easy and rather fun. Next up is an R2D2 shirt (my kiddo's other love).